Rev. Kenneth C. Curry, Jr. is a native of Los Angeles, California, where he was born and raised. The oldest of four children, Rev. Curry’s exposure to Jesus Christ came at an early age and propelled him to grow in the grace and knowledge of God. He received his formal education from several schools within the Los Angeles Unified School District, graduating from the Magnet Program at Venice High School. Rev. Kenneth Curry has been involved in church ministry since the age of eight, when he accepted Christ as his Lord and Savior. He began his formalized ministry at True Vine Baptist Church, of Lynwood, California, under the leadership of Pastor John Hopkins. There he was licensed and ordained in 1991 and 1995 respectively. he earned Bachelor degrees in both Psychology and Communications, followed by a Masters degree in Education in 1996. Upon graduation from Oral Roberts University, Rev. Curry began a career in Social Services which lasted approximately seven years before yielding to the call of full-time ministry. In 2001, Rev. Curry joined Friendship Baptist Church (FBC) of Yorba Linda, California to serve as the Youth Minister. He quickly demonstrated his administration and organizational skills which inevitably caused his position to evolve into Minister of Children, Youth, and Young Adults. In 2011, Rev. Curry advanced to the position of Executive Minister, executing the day-to-day operations of the church, worship/ministry planning, and general ministry execution. Having a heart for God’s people and a continued desire to rightly divide the Word of God, Rev. Curry obtained his Masters of Divinity from Golden Gate Baptist Theological Seminary in 2011. He received the schools highest graduating honor, “The William O. Crews Presidential Leadership Award” and is considered a chief among leaders! Rev. Curry aspires to obtain a doctorate degree in African-American Church Administration or Homiletics in the very near future. In his 24-year ministry span, Rev Kenneth Curry, Jr, has served as Elder, Assistant Pastor, Bible Study Teacher, Workshop Presenter, Ministry Planner, and Traveling Evangelist. His preaching is energetic and motivating, utilizing all of his being and illustrative insight to give clarity and application of the Word of God. 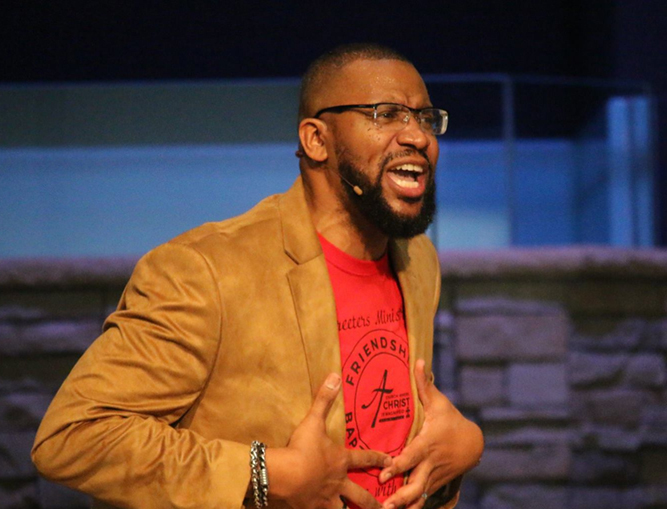 Speaking engagements to his credit include: the FBC Rhema Men’s Conference, FBC Youth and Young Adult Conferences, First Institutional Baptist Church Minister’s Conference, local and out-of-state Youth and Young Adult Conferences, and more. His ability to minister to all ages, gives witness to his adaptability in articulating the truth of God’s Holy Word. As the leader of FBC’s Annual Youth Retreat for over 12 years, hundreds of youth from FBC and other churches, along with un-churched youth from the community, have had opportunities to make life changing choices in accepting Jesus Christ as Lord and Savior. Rev. Curry has served on National and International missions teams, spreading the gospel as far as Albania; and participates on various ministry boards and initiatives, including Head Start Planning and Research. He has served as President of the Board of Directors for Transformation Ministries, which provides leadership to local, national and international ministries; supporting missions outreach; and equipping new Pastors with tools for successful leadership. While not the present currently he is still a board member. For Rev. Curry, ministry is his life! On September 1, 2013, Rev. Kenneth Curry accepted the call to be the Senior Pastor of Friendship Baptist Church, of Yorba Linda, California. He assumed the helm when the church’s only Pastor, Bishop James D. Carrington, retired after 48 years of service. FBC is one of the largest Baptist churches in north Orange County with many congregants who travel from surrounding cities and counties to experience God in the faith community affectionately known as the “Ship”. As Rev. Curry moves into his new role as Senior Pastor, he strives to continue serving the Kingdom of God with excellence and leading Friendship Baptist Church into its fullness of purpose and blessings, in God’s fullness of time. On June 14, 2014 Rev. Curry welcomed the former Karima Deadrick as his new bride and ministry partner. They are excited about what the future hold for them as a couple and family, in ministry, the community, and the ultimately the world. All sessions by Kenneth C. Curry Jr.